If you have good access to e85 in your demographic, and own or play with a performance vehicle equipped with an internal combustion gas engine, especially something with either very high compression, or most of all; some boost or NOS – then e85 fuels are something to be considered. This is nothing new when looking at the big picture for the last several years , but it’s somewhat new to us in our area where Alternative Auto Performance is based. This is very much something to take a closer look at if you have access to it and are considering burning it in your performance car or truck. Here at Alternative Auto Performance, we’ve tuned hundreds of EFI equipped performance cars in the last several years on e85. Starting in 2010, we actually started to do many more e85 conversions to customers cars as well as some of our own internally owned shop vehicles. Without getting into a lot of the science and chemical break down of what e85 is made out, I’m simply going to state what makes it so awesome to the automotive performance world. Number one: its rated at 105 octane. This is an incredibly welcome feature of e85 fuels. Most unleaded “race fuels” sign off at about 100 octane, after that it’s all leaded usually. And also its cost; Currently as of early 2013 its sitting at about $3.00 a gallon. Most race fuels that might still be available at the gas station pumps snuck up to nearly and over $8.00 a gallon as of summer 2012. And if you order or buy your race fuels by the 55 gallon drums or whatever, some of them are getting to be over $10 to $11+ a gallon. E85 is not a replacement for some of the really high end “leaded racing fuels” that are available in the performance industry, but from what we’ve already learned in the last few years is that e85 is very clearly a replacement for your typical leaded race fuels that are rated at about 110 octane. Even though e85 is about 5 points less octane then most of the leaded race fuels – e85 burns cooler than most other gasoline fuels. Consequently we learned that once you make the necessary fuel system hardware changes, and appropriate tuning changes….that with e85 you can run the same spark or ignition timing that you did under heavy load and boost as you did with the usual race fuels that were rated at about 110 octane. Part throttle and light load timing for the most part needs to stay about the same or slightly less with e85 fuels because of its flame front. If your switching from the usual 91-93 octane up to e85, this change can cause a huge gain in performance because with e85’s 105 octane rating, you can ramp up boost and ignition timing for very big gains in performance, or build in more compression, or more NOS as well. If you’re considering the switch to e85, we strongly recommend that you purchase an e85 checker from a company called “Quick Fuel”. 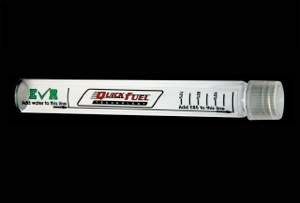 They make a very handy tool that allows nearly instant and real time ethanol content checking of e85 fuels. 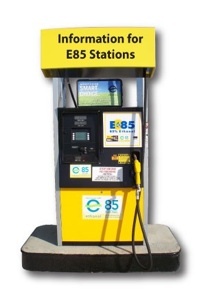 E85 fuels are switched in some parts of the country to e75 or less during the winter months to promote better cold weather start up’s. Here in Michigan we found consistently for two years that is maintained at e85 from March till late November. And was only reduced to about e77 for the colder months. This didn’t put a damper on anything for us, because as most “car guys” would agree “our season” is pretty much from April till about October.